Located in the Algarve, along Portugal’s south coast, holidays to Praia da Falesia revolve around its golden sandy beach. Sheltered by golden cliffs it remains warm and balmy and protected from the wind throughout the year, with the wind hitting the waves further into the ocean and perfect for water sports lovers. This long stretch of beach is backed by bars, cafés and restaurants, from family friendly menus to upmarket menus designed by expert chefs. A holiday to Praia da Falesia is perfect for both families and couples wanting to enjoy a quiet break, with everything you need right at your fingertips. Luxury spas and professional standard golf course provide the ideal opportunity for those wanting to simply relax and unwind. If you prefer to explore the spectacular natural landscapes surrounding the town, head into the forests and breath in the fresh pine scent with hiking, mountain biking and horse riding tours. Book your luxury Praia da Falesia holiday with Sovereign and we’ll take care of every little detail. From booking excursions like sunset cruises to ensuring family friendly extras like cots, baby facilities and more are waiting for you in your room we’ll ensure your holiday is as relaxing as possible. Our expert Travel Advisers are on hand to help you find the best restaurants, cafés and day trips. Choose from the hand picked five star hotels in our collection. The Pine Cliffs Residence is a chic, modern resort full of amenities to cater to families, couples and groups alike. Choose from 10 excellent bars and restaurants, enjoy the fantastic kids’ clubs and family friendly activities. 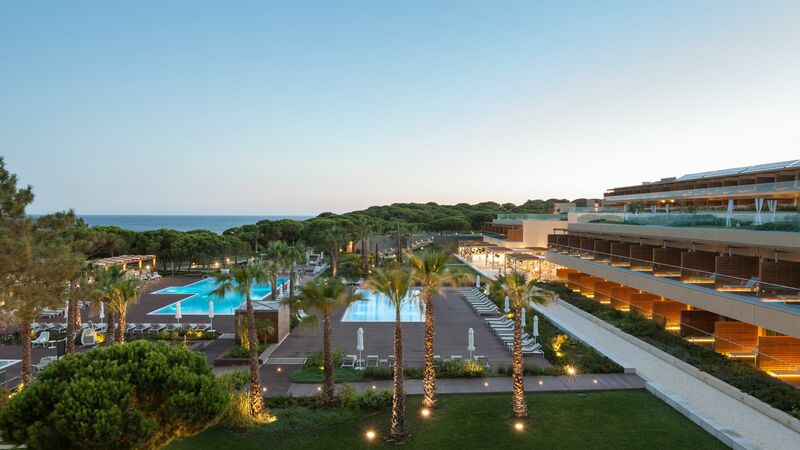 The EPIC SANA Algarve Hotel offers a dramatic setting overlooking the Mediterranean from its clifftop location. Enjoy the selection of swimming pools, spectacular views from each of the rooms and suites and the Blue Flag beach in front of the hotel. Flights from the UK to the Algarve take around 2 hours 40 minutes. Transfer time from Faro airport to Praia da Falesia is approximately 35 minutes. Summers in the Algarve get pretty scorching, so beach-goers can expect the mercury to top 30°C in July and August. The shoulder months of April, May and October stay at a pleasantly toasty low 20s, and even in winter, things rarely drop below 15°C – ideal for year-round golfers. A service charge won’t typically be added to your restaurant bill in the Algarve, so it’s common to leave a tip of around 10% of the bill. The same goes for taxi drivers – aim for 10% or round up your fare to the nearest euro. Tipping is not expected for bar staff, hotel porters or maids, although a euro or two would be appreciated for excellent service.